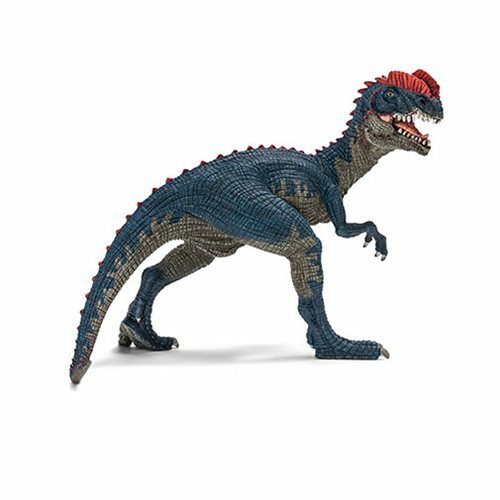 In excellent detail, this Schleich Dinosaur Dilophosaurus Collectible Figure features a beast that lived about 200 to 192 million years ago. The Dilophosaurus was one of the first large carnivorous dinosaurs of prehistoric times. Measuring about 6-inches long x 4 1/2-inches tall, this smaller collectible figure features a movable lower jaw and comes with an informational booklet, so not to worry! After the Compsognathus and the Velociraptor, the Dilophosaurus was one of the fastest prehistoric lizard-like dinosaurs. Despite its 6-meter long body, it weighed only 500 kg and had long, powerful hind legs, with which it could easily reach speeds of up to 38 km/h. It had two striking bone crests on its skull, which led to it being called the "Double Crested Lizard." These crests were indeed big and long, but they were too thin to aid in defense. Instead, scientists believe that they were used to impress rivals. Are you impressed?